The question of “analogue or digital?” is being discussed for over twenty years now amongst hifi fans. While some swear by the (ostensibly) warmer vinyl sound others swear by the sophisticated, comfortable digital technology. The recently released Peter Gabriel Clarity Vinyl records considerably up the ante for the quality of analogue sound rendition. In 2000 Classic Records brought out Peter Gabriel’s albums as 200g QUIEX SV-P vinyl high-end editions. The announcement of another new edition of his first five studio albums came as a surprise in late 2009. How could the absolutely perfect 2000 edition possibly be improved upon? The new slogan is “Clarity Vinyl 45rpm series” and claims to be even better than “absolutely perfect”. Each album comes in a sumptuous red 4LP box sealed with a white sleeve. 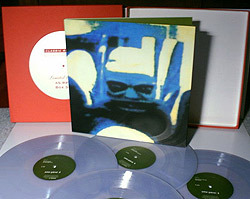 Inside the box there is a reprint of the record cover and four clear vinyl discs packed in bubble wrap. There is a monochrome print on the recorded side while the empty other side only has a stroboscope ring to permit checking the exact speed of the turntable. For the first go I put Peter Gabriel I on the turntable of my Acoustic Solid Small Machine. First I had to switch from 33 1/3 tp 45rpm, of course. The advantage of the higher speed lies in the higher density of the music information. When the needle of my pick-up (Audio-Technica AT95E) lowered itself into the extra deep-cut groove I did not believe my ears: The first notes of Moribund The Burgermeister have delicate dynamics, details and nuances, so realistic and immediate as if you were looking down the singer’s throat. No clicks and no hisses come from this well-produced perfectly level vinyl disc; this is mainly due to the new vinyl mix (SV-P II vinyl a.k.a. Clarity Vinyl). The crucial ingredient is the best co-polymer that was available. The makers also dispensed with the carbon black that contains traces of magnetic metals and thus creates electric disturbances in the pick-up. Further measures taken to reduce surface noise are the single-side pressing that allows a deeper groove and bigger groove modulations. 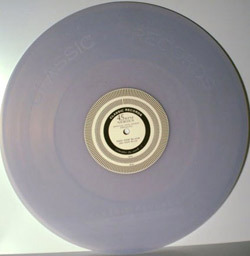 The larger vinyl mass (200g) also reduces cross-talk attenuation. After the second song, Solsbury Hill, you have to switch records for the first time. The records, that are kept in an expensive Nagaoka sleeve, contain only two or three songs because of the inherent problem of all pick-ups (mine is a Rega 250B) that the needle at some point does not run down the groove smoothly anymore like a bob runs down the ice canal but tilted. For this reason the groove ends before the final third of the record side where the problem is the most serious. Changing records four time per album is, of course, totally unacceptable for the ordinary music consumer in today’s age of mp3 and shuffle play. Vinyl freaks may, however, experience almost sensual pleasure from dealing with this classy material and the fascinating technology. Here Comes The Flood brings on a torrent of emotions that pull the listener into the unfortunate event. Intruder from Peter Gabriel’s third album also takes your breath away when sound events move into your space and create an impression of a concrete threat. This is what audiophile equipment is all about: creating emotions that captivate you more because of the detailed, three-dimensional soundscape than normal, superficial listening habits ever could. Peter Gabriel IV on the other hand may never become an audiophile highlight. Neither mastering nor the transfer from the original 1/4" two-track tapes that was supervised by the highly-esteemed Bernie Grundman could change that. Gabriel’s recording techniques at the time were simple too experimental. The 1986 album So is quite the opposite. It is utterly remarkable how Tony Levin’s bass reached down to the very bottom in Sledgehammer without degenerating into bloated bass mush. You will not find any distortions that happen so frequently when you have an “s” sound. It is a pleasure do listen to the recording and to discover nice details in soundspaces you never knew existed. All this does not at all wrap up the “analogue vs digital” discussion, but a number of technical improvements produce a significant leap forward in quality. What struck me as not so good is the fact that the centre holes are not, well, well-centered. After a couple of spins dust and electrostatic charges will lessen the listening pleasure. You can, of course, solve this issue with a professional record cleaner. The price of some 80 Euros per set is exorbitant, but you might want to consider that these limited editions will not be available forever – and should you decide to sell them on at some point in the future you are likely to get the at least what you paid, as long as the records are still in good shape.